There's nothing I love better than a classic Italian recipe. So when I first came across this idea, I had to work on my own version! Brown the sausage in a heavy bottom skillet. Remove sausage to bowl to add later. 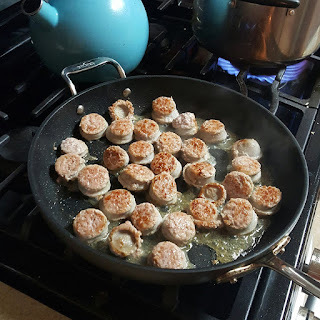 Saute the onion and garlic in the sausage grease. Add a little olive oil if necessary. Season with salt and pepper. Add the bell peppers. Saute until the peppers are wilted. Add the sausage back in. Add the tomatoes. Stir occasionally until the tomatoes begin to open. 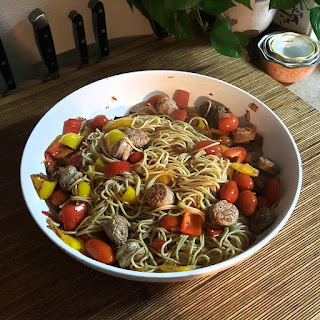 Toss the sausage and peppers with the pasta in a large bowl. Serve with chopped fresh parsley and grated Parmesan. Optionally, I like to add some crushed red pepper flakes with the the onions to give a little extra spice. I like to make this with some rustic, rough cut fresh pasta. Dried pasta works well here too.